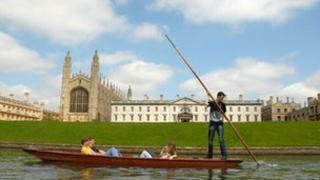 Punt touting in Cambridge is to be regulated by a voluntary code of practice drawn up by the city council. The code is intended to "reduce the nuisance of commercial touts to businesses and the public". It includes an agreed touting area for each company, limits the number of touts and sets out standards of behaviour when dealing with the public. Councillor Neil McGovern said companies had responded positively to the code, which comes into effect on 1 April. He said the code was necessary as businesses and visitors had complained about the number of "very annoying" touts in Cambridge. A survey carried out by tourism website Visit Cambridge in summer 2011, found an average of 23 touts operating daily in the most popular tourist areas of the city. From 1 April, commercial punt licenses will only be granted to businesses operating from six punt stations at Granta Mill Pond, Mill Pit west, Mill Pit east, Trinity College frontage, Quayside and La Mimosa. Companies who sign up to the code will receive "a form of kite mark" indicating they adhere to standards of best practice. Lawrence Austen, who owns Granta Punt Hire and operates from Granta Mill Pond, said: "We expect everybody on the river to have a good experience. "We recognise the commitment of the code in that it promotes Cambridge in a positive way." It will apply to all commercial operators on the River Cam, including river cruise companies. The council said the success of the voluntary code relied on local authorities, the police and city centre managers "adopting the spirit of the code". If it is unsuccessful at regulating touting, the council said it was "resolved to investigate further legal action".